A few months ago I flew to a different country to shoot a wedding. I needed to pack wedding related gear, which for me meant two DSLRs with 24-70mm f/2.8 and 70-200mm f/2.8 zoom lenses along with a few primes (macro and portrait primes). I also carried a collapsible reflector, two Metz 64 AF-1 flash units, flash modifiers, and some remote triggers. I had been using the same rolling gear backpack for years, but it had seen better days. Some of the straps were fraying, and the bag never balanced very well when pulling it behind me (it had only two wheels). As a result it tended to tip over to one side or the other, pulling me up short in the middle of speed walks through airports. That particular trip was the last straw. I decided that it was the last time I would suffer through that particular bag. After returning home, I began to do some research into replacement rolling bags. I wanted something airline friendly, a rolling backpack, but something tougher and more balanced for hauling my precious gear in. 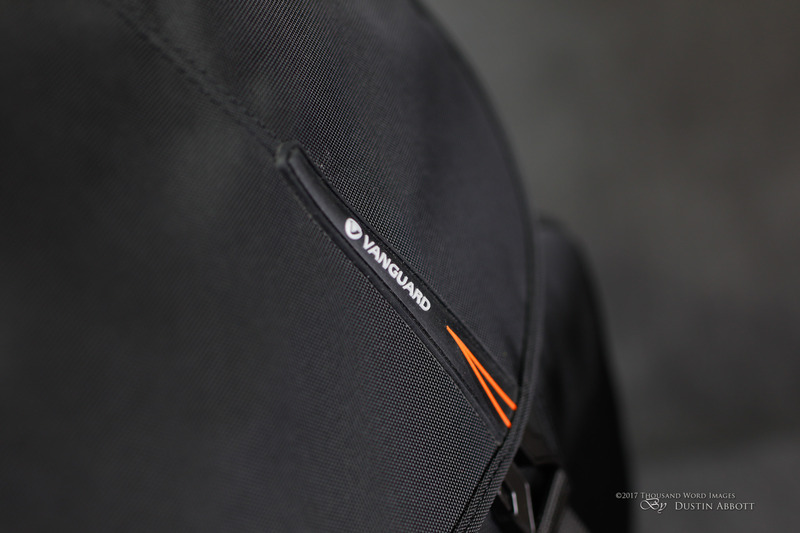 After looking at a number of options at B&H Photo, I opted for the Vanguard “The Heralder” 51T Rolling Backpack. Did I make the right choice? This review was birthed out of a subsequent trip where I packed a lot of gear over some long flights. Join me as I examine how the Heralder works for real world photography travel. 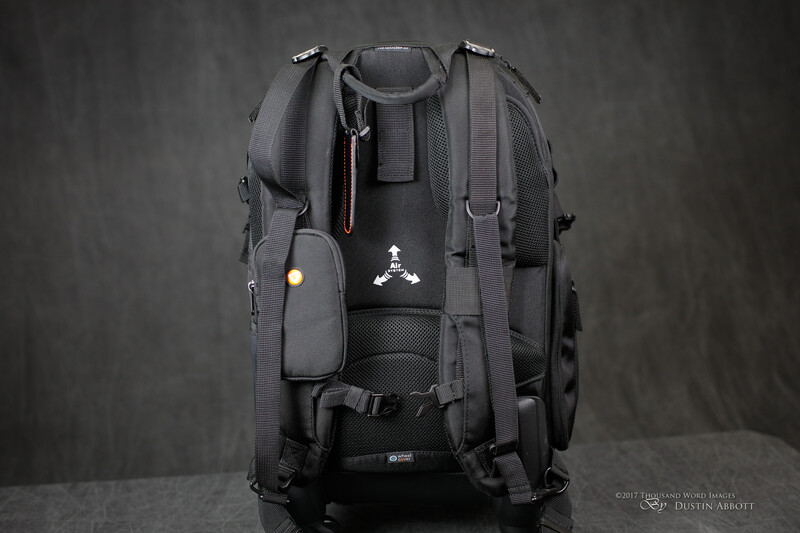 “Photographers in search of a multi-featured backpack to store, protect and transport 1-2 DSLRs, 5-7 lenses, 2 flashes, related accessories, up to 14″ widescreen laptop or 15” Ultrabook, and a tripod will appreciate the black The Heralder 51T Rolling Backpack from Vanguard. 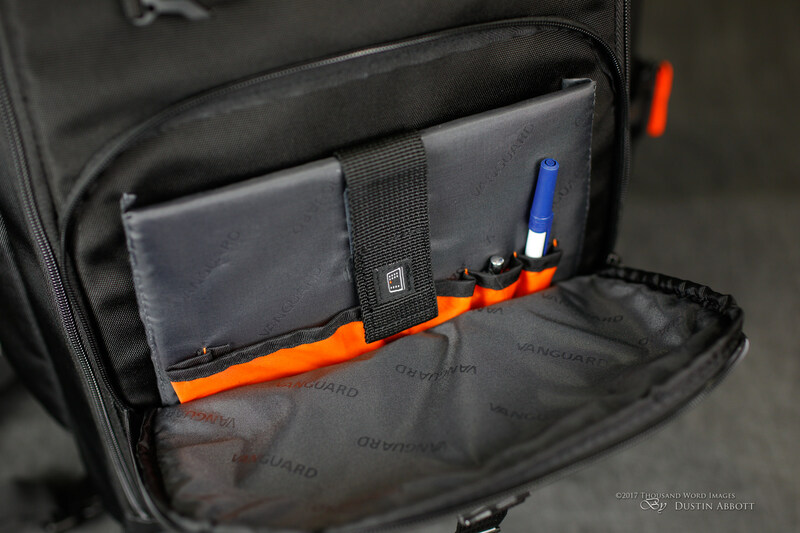 A padded sleeve with touch-fastening tab stored under the lid to the main compartment is designed to hold the laptop, while a removable padded insert with a variety of movable dividers store the camera gear. For use as standard luggage, simply remove the insert. Zippered, exterior pockets house a multitude of accessories. An exterior side pocket with an adjustable, quick-release strap above is designed to secure a compact tripod. The bullet points gives you a quick idea of the basic high points of the bag, but how well does all of this work in the real world? The primary selling point for me, personally, was the four trolley wheels that would allow the bag to function like modern “spinner” luggage. 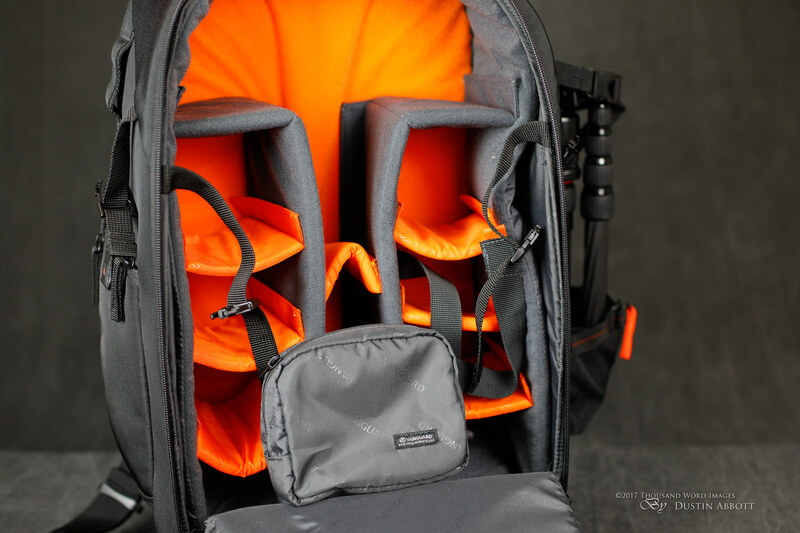 More convenient to use in different airport situations, “spinner” designs are also more friendly if you need to stack something on top (a smaller bag or jacket, etc…) and allow you to push, just roll along, or pull behind. This becomes very important if you are also contending with another bag. 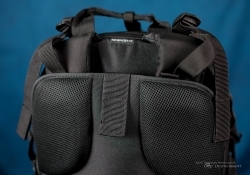 It is also very important if you just want to use the bag to transport gear (walking in the city, in a building, etc…) The bag is designed to work as a backpack, yes, but that probably should be perceived as it’s secondary purpose. The four wheels are the mainline attraction, and you can pack some heavy gear into the Heralder and not worry about having to carry it. 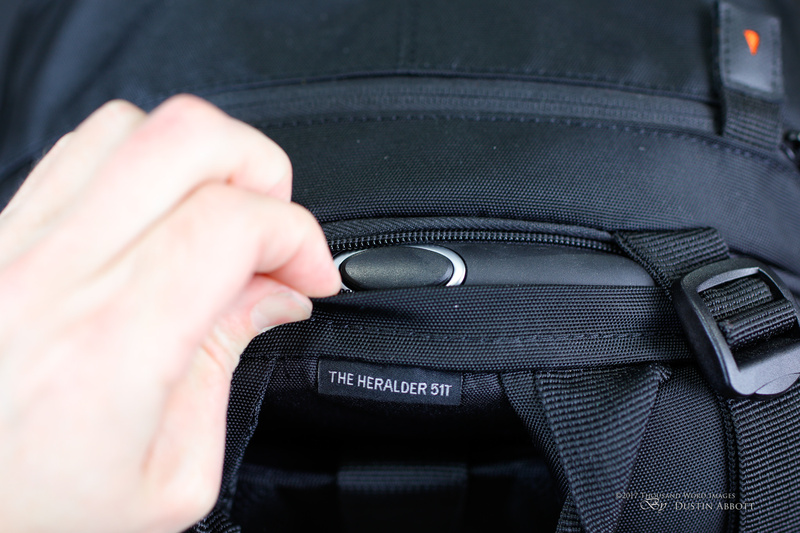 The bottom line for a bag like the Heralder (particularly at its price point) is how well it performs for air travel. 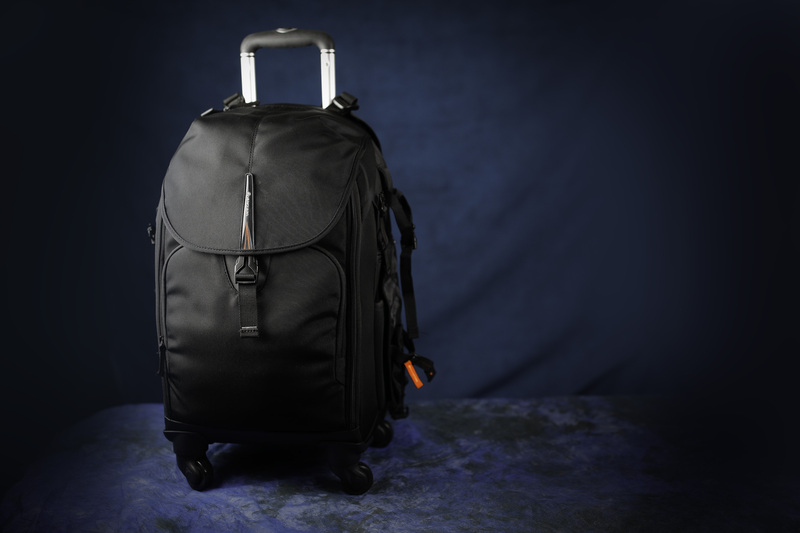 There will be other applications for a rolling backpack, but the place it needs to ultimately succeed is as an effective way to transport your expensive gear in the demanding and sometimes abusive environment of air travel. I’m an experienced traveler, and thus have a pretty firm expectation of what I’m looking for. My priorities may not be your own, but as I itemize these details you can form your own checklist of what you value and what you don’t. 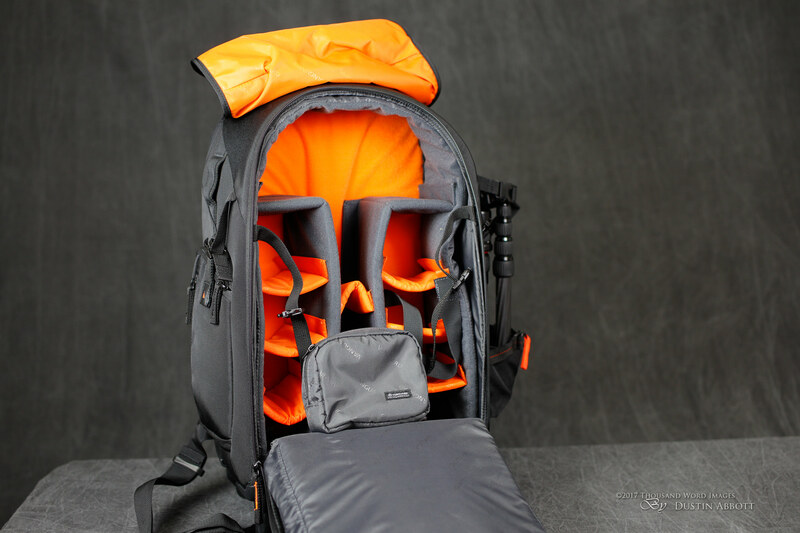 If you are looking primarily for a backpack that you might occasionally roll, then you should look elsewhere. The Heralder is not a light backpack. It is a bag for those that are looking for a rolling case first and a backpack second. The sturdy construction combined with the four built in wheels results in an [empty] weight of 9.6 lbs/4.4kg. 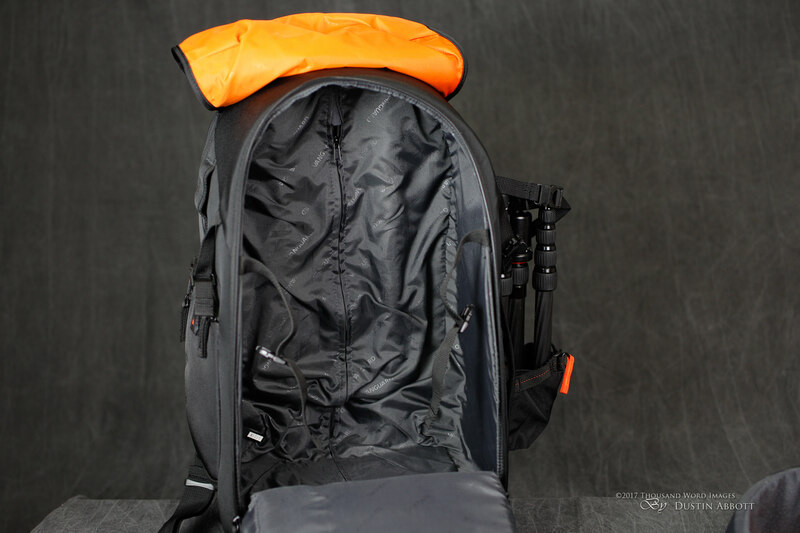 The Ruggard Thunderhead 75 backpack I also use is similar in size but noticeably lighter at 5.5 lbs/2.5kg. When you begin to add gear to the Heralder the weight quickly adds up. You’ll note that the Heralder has a slightly bigger exterior and a slightly smaller interior versus the Thunderhead due to the extra space needed for the wheel and handle assemblies. If you don’t need the rolling capability (and particularly the “spinner” capacity), there are lighter options. 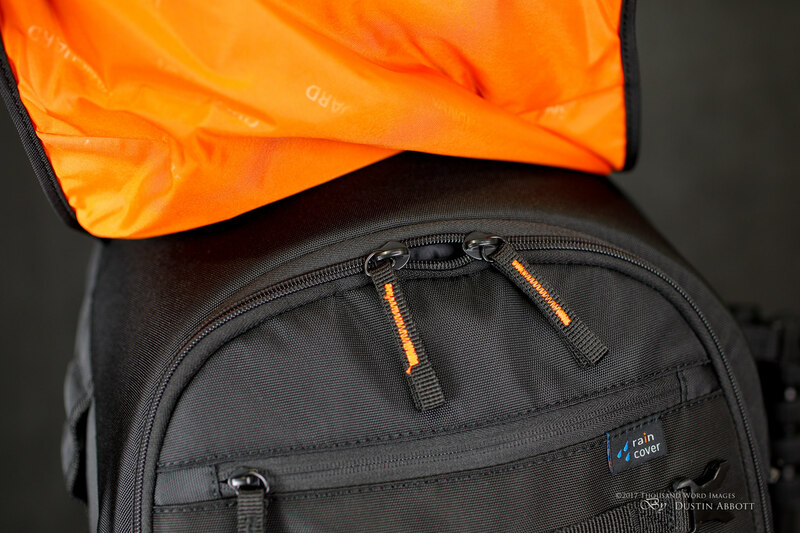 Vanguard makes the Quovio 49T rolling backpack that is a “pull” bag (two wheels). It is only slightly smaller inside but also comes in at over two pounds lighter mostly due to a lighter wheel assembly. I think it is important for you to know that you want the four wheels even though it comes with a few drawbacks (like weight and the loss of a little more interior space than equivalent sized bags. For many the added convenience of the bag will be worth it (user reviews are very high), but that extra rolling versatility comes at a cost. I wanted the four wheels, so I can accept the weight, but I wouldn’t mind if the bag was a pound or two lighter. The Heralder has a number of ways to carry or transport it. There is a sturdy top handle that is good for grabbing the bag quickly to lift it up. It has nicely padded straps along with chest + waist support straps. 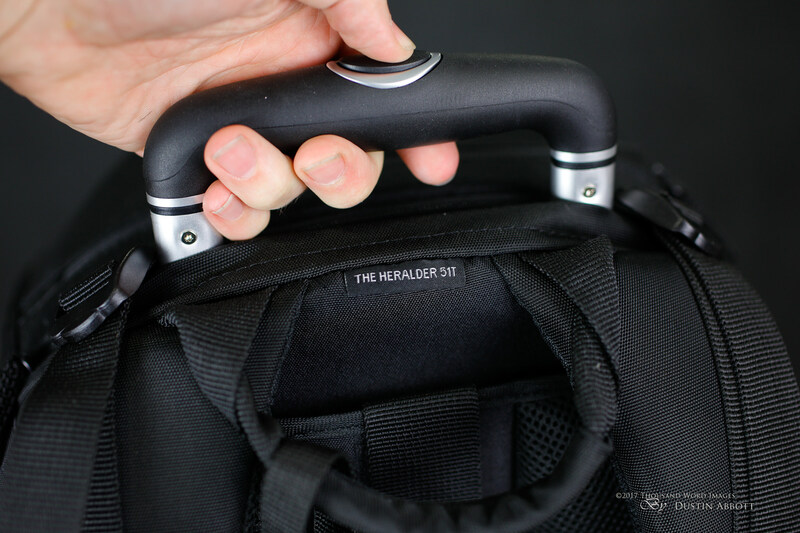 What further distinguishes the Heralder is that underneath a zippered cover there is an integrated 3 stage retractable trolley handle with four built-in wheels underneath. Ironically, the handle is so well integrated (and hidden) that one user reviewer returned the back and complained that it had no handle! The handle is there, and extends out far enough that it is plenty high for me (at 6’1″). The bottom line of why I wanted a bag like this was because of the wheels, and, specifically, the ability to use the bag like a carry-on that will track and can be rolled upright rather than pulled behind. I was tired of my old bag tipping over or starting to rock. Most wheeled backpacks have only two wheels and must be pulled, so the Heralder is fairly unique in having four wheels. As a result, you can put it on your back, you can pull it, push it, walk along with it to the side, or even carry it by the handle. Options are good when traveling! 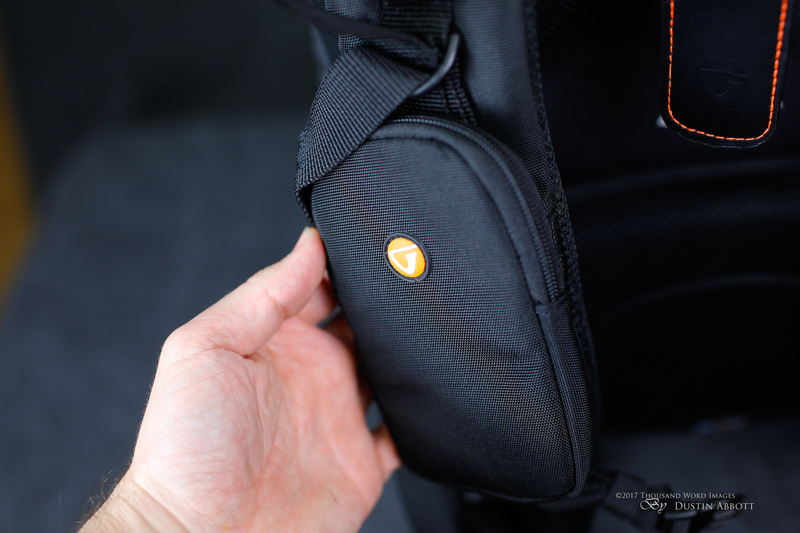 I like the fact that if you don’t need the backpack portion that the straps can quickly unclip at the bottom and tuck into a section at the top, while the bottom waist strap can do something similar at the bottom. This keeps you from having any stray straps that are dragging or getting in the way. The trade off in this is not only the weight increase that I noted, but also that the solid bottom plate extends across the whole bottom of the bag. That makes the bag itself more rigid, so the bag essentially occupies its full footprint whether it is full or empty. 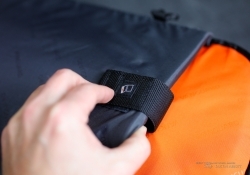 I also noted that the bag has a tendency to “drift away” if you are on hard surface with any kind of slope. There isn’t any kind of “friction surface” to hold it in place. There is a wheel cover in a lower pouch that you can bring out to cover the wheels if you don’t want them, and this is the best way to keep the bag from rolling away. The primary purpose of these covers is to keep any dust or mud that might be on the wheels from getting on your clothes when you carry the Heralder as a backpack. I was a little disappointed in the rolling of the bag. While everything moves easily (though some airport hallways are carpeted rather than bare and thus require a little more effort) the bag doesn’t consistently track well. It wants to pull off to one side or the other. I found that I needed to rotate it to get to a position that it liked and would track consistently in, though that sometimes resulted in a holding position at the handle that was less comfortable. This is probably specific to my bag, as I haven’t noticed this complaint from others. I intend to contact Vanguard and see what my options are for service or replacement. The strength of bags like the Heralder is their ability to hold a lot of gear. They can swallow multiple DSLRs with a number of lenses/flashes (1-2 DSLRs, 5-7 lenses, 2 flashes). And yes, you can fit a gripped or pro-series camera body in there; there is plenty of depth. One nice touch here is that the whole padded divider section can be removed from the bag, allowing you to use it as a traditional carry-on suitcase with a nice amount of room (the bag is quite deep). 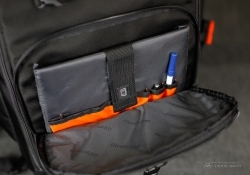 There are multiple locations where one can store a laptop (up to 15.6”) and an iPad. There are pockets and storage nooks all over the bag, making sorting different items easy, though I find that some of them feel restrictively shallow and work best with items that will lay fairly flat. 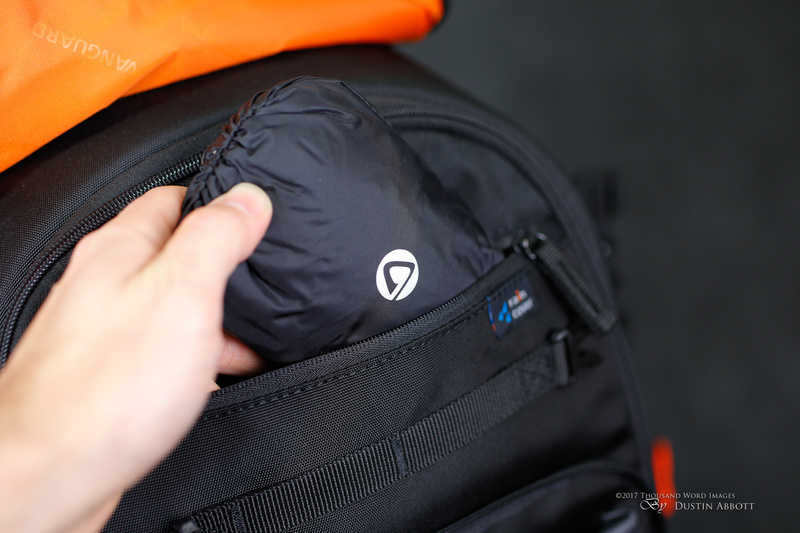 The main side pouch zips around three sides rather one or two, allowing it to swing out for easier access. There are a few specific memory card pouches there, too, which is a nice touch. There isn’t really an “flex” to the material on most of the pockets, so it is mostly shallow items that will fit well in the exterior pouches. There are some nice options along one side for storing a tripod of varying sizes (the bag has different stages of support for different size tripods.) I brought along the excellent little Oben CT-3535 carbon fiber travel tripod on my trip, and it feel neatly along the side without issues of any kind. The bag is designed in such a way that the whole divider section can be lifted out as one piece, allowing the Heralder to convert to “normal luggage”. 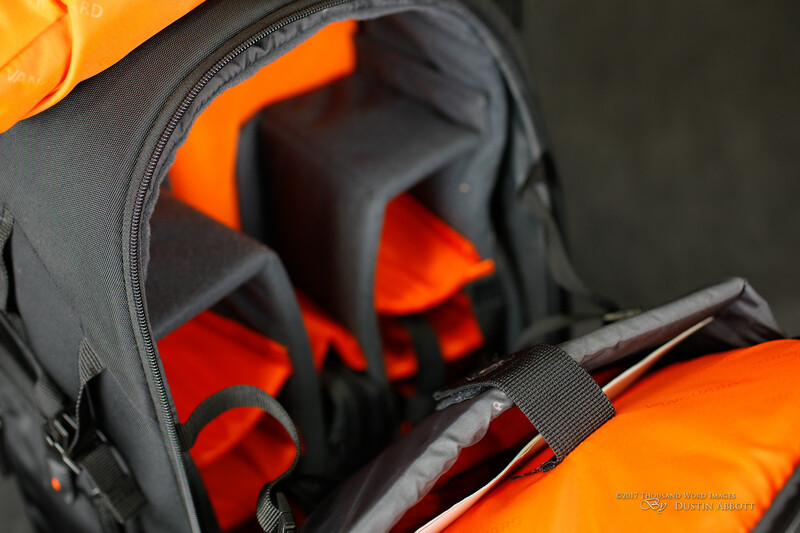 For my recent trip to the Southwest I actually removed the padded dividers and carried a smaller trail backpack inside with my gear tucked into it. This left a space for various other items that I wanted to carry on the plane. The one drawback for airline travel is that the size of backpack means that it will only fit in either the overhead bin (on a good size plane) or checking it at the ramp when you get on the plane. It won’t fit underneath the seat in front of you (and these days legroom is scarce anyway as it seems they cram more seats into each new generation of airplane). The point being that whatever you want at your seat will require you removing it prior to stowing the bag as it won’t be an easy bag to access while flying. This is a big deal for me, personally, as this is my whole reason for wanting the bag. The Heralder was able to fit in the overhead bins on both my flights (the plane was an Airbus 319), though without a lot of room to spare, so your mileage may vary depending on the plane. I’m pretty particular when traveling about not being parted from my expensive gear, and I find that this is far less likely to happen when approaching the gate wearing a backpack as opposed to carrying or rolling a bag. I had no issue with being parted from my bag on the trip, which makes me happy. What the bag lacks for airline travel is any kind of locks, which would be a nice touch to help bring some reassurance should you have to check the bag before planing. One thing I do like is that the zippers for the main pouch can all be hidden underneath a cover that folds over the top of these and buckles in. This means that no one can just casually get at a zipper. It also gives the Heralder a sleeker look with fewer seems and zippers visible. The different options for carrying the bag were helpful when navigating the narrow center aisle of the plane. 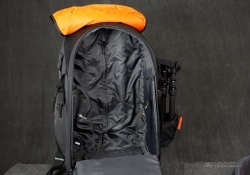 One nice thing for the times you are using it “trolley-style” is that all the backpack straps will fold inside different areas, giving the bag a cleaner look. I didn’t notice this at first and felt like I was dragging straps all the time. I have already pointed out that the Heralder 51T should really be considered a rolling bag first, and a backpack second. The Heralder has padding at all the right places, nice thick straps (which is important considering how much gear you can potentially pack into it), and a fair amount of adjustment. There are supplementary chest and waist straps/buckles to help you keep tension in the right areas. The handle will completely disappear inside the back and can be zipped away. The wheels are another story, which is why to me the Heralder is never completely convincing as a backpack. I can feel those wheels dangling behind me (although thoughtfully the two wheels that will be closest to your body have covers that can be pulled out of a nearby nook to cover them and keep them from dirtying your clothes.) People are shaped differently, of course, but for my body it feels like the bottom third of the Heralder doesn’t rest quite right. It pushes out a bit from my body rather than nestling in. It may have something to do with the reinforced bottom plate for the wheel assembly. I’ve not yet used a rolling backpack that felt great as just a backpack. You adjust, of course, but I get the feeling that backpacking should only be done out of necessity rather than as a matter of course. It’s great to have the option, but the Heralder is best suited to rolling along rather than being carried. 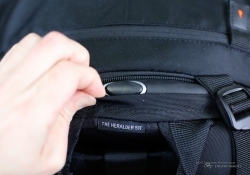 It probably won’t surprise you to hear that the Heralder is built out of high end fabrics and materials. It starts with the 1000D coated Nylon fabric. Doing some research on this fabric turned up this, “(1000D) is a textured nylon for a natural spun-like appearance, with excellent resistance to fading, abrasion, rot and mildew. 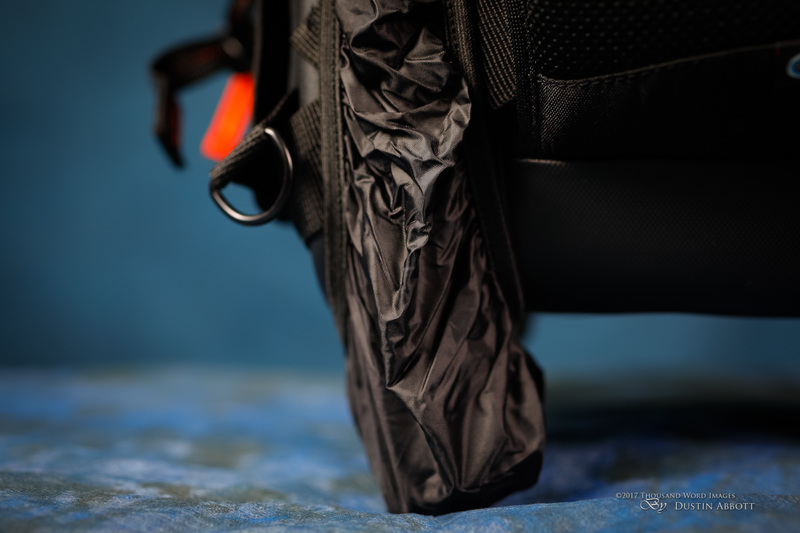 Quick drying, and highly water repellent…” Sounds like just the material you want for this kind of bag! The secondary material is 150D Polyster, which is ultra strong, highly resistance to fading, and is also waterproof. These are the premium materials for this kind of bag, and then end result is a very tough, very durable, and highly water resistant bag. That’s kind of a big deal with a bag that will be exposed to the rigors of airline travel. I never cease to be amazed how different a piece of luggage can look after just a few hours of plane ride! 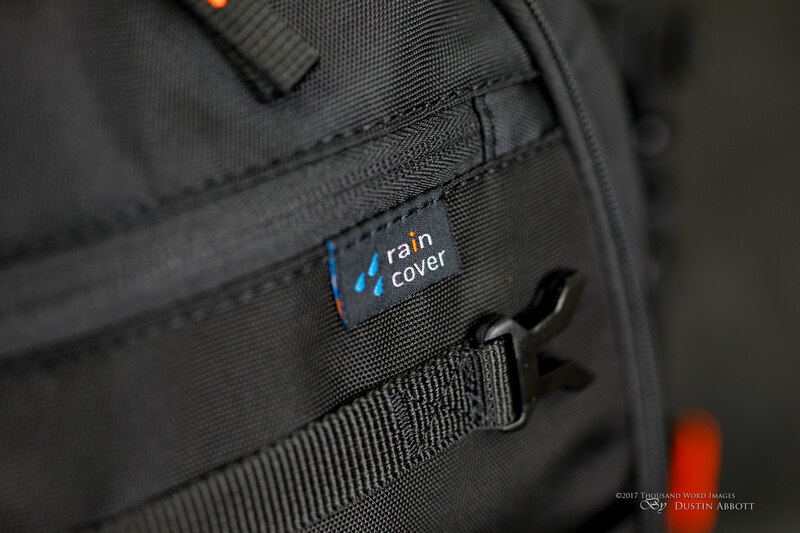 Not only are the bag’s materials highly water repellent, but there is a full rain cover tucked into a pouch as well. The bottom is designed to just be washed off if it gets dirty. The bag also comes with a few extras, including a pouch that holds accessories or a cell phone that connects onto one of the straps, and also another accessory pouch that you could use for either photography related gear (I put some filters in it for this trip) or even for a few toiletries. The Heralder comes with a “5 Year extended warranty”, which helps add some piece of mind on the matter of its toughness. I think it is extremely important when deciding on a rolling backpack like this to have a clear idea of your expectations. Will you use it more as a backpack, or more as a rolling case? If your priority is for a backpack that you might occasionally roll, I think you might be served better with something else. There are cheaper, lighter alternatives. 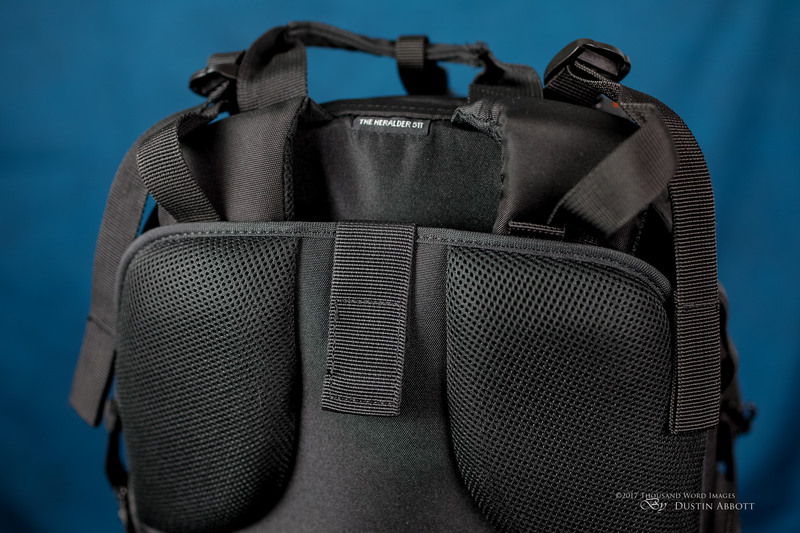 But if you are looking for a versatile rolling case to store a lot of gear that you can also carry on your back when needed, then I think the Vanguard The Heralder 51T Rolling Backpack is a great choice. The ability to quickly change it over to traditional luggage by removing the gear lining might allow it to serve as a “two-for-one” bag for many people. It is made from tough, durable materials and has a versatile, configurable interior. As mentioned, my review copy didn’t track as well as what I would like, but I will follow up on that and get it serviced or replaced as other users seem very happy with its rolling smoothness. I would have also liked a little more stretch in outer pockets. There are a lot of useful places for storing (and sorting) gear, however, and everything is well protected. The standard price on the Heralder is $299, which makes it cheaper than some competitors but also a fair bit more expensive than the cheap alternatives. What sets the Heralder apart from the competitors, however, is the four wheels rather than two, which gives it a distinct leg up in its versatility for rolling along the hallway, street, subway car, or airport. If you are a photographer on the move, give the Heralder a look; it might make your life much more convenient! Room for a LOT of gear! Inner divider section can be completely removed to convert to traditional luggage. Thanks to my partners at B&H Photo for supplying the retail copy of the Heralder for my review. Purchasing from these links helps support both them and me. Thank you!